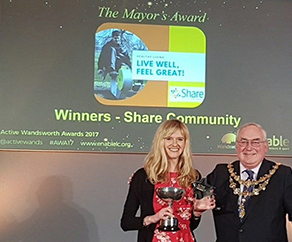 We are still on a high after winning the 2017 Mayor's Award at the Active Wandsworth Awards in February for our healthy living project, Live Well, Feel Great!, supported by the Wimbledon Foundation. The Award recognises an individual, organisation or project that increases opportunities for disabled people in Wandsworth to participate in sport or physical activity. The aim of our healthy living project is to tackle some of the health inequalities faced by people with learning disabilities, and the project is already making a significant and positive difference in our students' overall wellbeing. But it doesn't stop there! We have lots of plans for the future and look forward to providing even more healthy living opportunities for our students in the coming year. 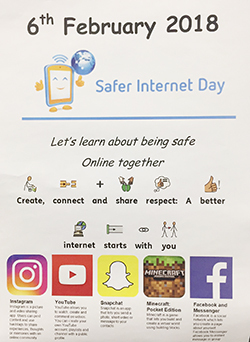 We used 6th February 2018 – Safer Internet Day – to reinforce some everyday learning about staying safe online for our students studying independent living skills. Digital skills at Share aims to find innovative solutions to help our students live, learn and communicate in a way that suits them best, whether this is for living, work or simply for fun. This day is all about the community, with a little something for everyone. Join us on for a fun day for all the family! To find out more or get involved, contact Jenny Bourlet via email jennyb@sharecommunity.org.uk or telephone 020 7801 9813. Or register for the event on the Share website. 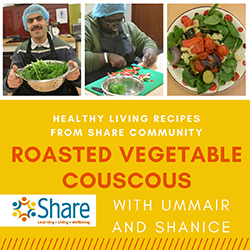 In this month's recipe video, Ummair and Shanice show us how to make Roasted Vegetable Couscous! This is one of 12 recipes appearing in Share's Impact Report for 2016/17 which this year is a recipe calendar! All of the recipes in the calendar were developed as part of Share's independent living skills programme in association with our healthy living project, Live Well, Feel Great!, to help our students to learn everyday skills such as cooking a simple, nutritious meal for themselves. As well at 12 mouthwatering and healthy recipes, the impact report showcases our work, including our students' achievements and stories. Each video recipe of the month also appears on Share's YouTube channel. In January, Mark showed us how to make Overnight Oats, and in February, Chris showed us how to make Eggs en Croute. If you can't wait for each recipe of the month, get all 12 recipes in our FREE recipe 2018 calendar by contacting Jane Wingfield, Share's Wellbeing Administrator, via email janew@sharecommunity.org.uk or telephone 020 7801 9812. We hold information about you because you have had some previous contact with Share Community. We do not buy or sell any personal information. If you don’t want to hear from us, that’s fine. Just let us know by emailing info@sharecommunity.org.uk so we can update your details. A big Share welcome to two new members of staff. Karen Miles (far left) joins us as our new Wellbeing and Outreach Manager to head up our Wellbeing team, and Zahra Mohamoud (left) joins our Training team as a Learning Support Assistant. A reminder that we hold parents/carers' meetings every two months at Share's offices in Battersea. These meetings are an opportunity for people to tell us how we can support them and the person they care for better. Visit our website for more details. To book your place at one or all of these meetings, contact Karen Miles, our Wellbeing and Outreach Manager, via email karenm@sharecommunity.org.uk or telephone 020 7801 9812. We are looking to grow our horticulture team! If you have experience supporting people with learning disabilities and autism, and love to share your passion for plants and gardening, we want to hear from you. Visit our website to find out more or contact Leanne Wood, Share's People and Projects Manager, via email leannew@sharecommunity.org.uk or telephone 020 7801 9825 for more information. Saturday 2 June 2018. Plant Sale and Healthy Living Community Day.